Last week when I was in St. Paul, I visited the room where I was born. It wasn’t the hospital suite where I’d taken my first breath, but the church where I’d been baptized a few months later. When my grandmother was clearing out some old photo albums last year, she’d sent me a thick envelope of them, including one that captured my baptism–family gathered around a big granite font, Mom holding me, god-mother holding a candle. It’s in a collage above my desk, the background a typical church scene–naked walls, nondescript pews. During the year I worked after college, I both served a day job and pursued confirmation in the Episcopal Church; the latter required legitimate proof of my baptism into faith in the Triune God. 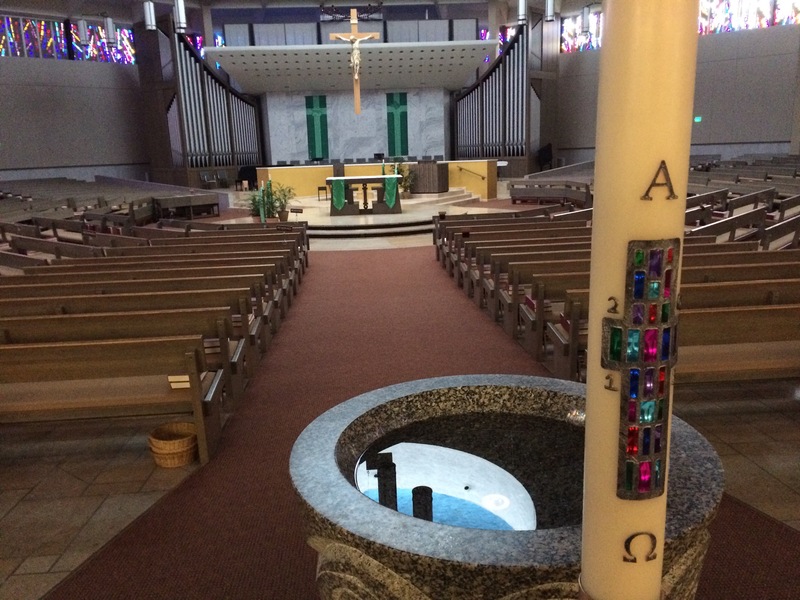 I scraped together evidence and made phone calls to churches in St. Paul, finally finding the records at a community of three combined parishes, now called Lumen Christi Catholic Community. Every time I’d visit the Twin Cities, I’d pass it, and I’d sort of vaguely and passively think to myself, “Ah yes. That’s where it must have happened.” After the year I’ve had, though, it occurred to me to go and see, touch, witness, and experience the place where I’d been given up to God. I’ve spent plenty of the last twelve months questioning my work and call, desperate for enough strength to finish the day, sometimes frightened that I didn’t feel as if I wanted to continue with anything at all. I was so grateful (to Lumen Christi and to Roman Catholic churches generally) to find the doors unlocked–free, unfettered entrance into the House of God–and I slipped inside. Walking toward the main nave, I saw the font immediately and recognized it from the photos; it seemed almost too good to be true–no confusion in finding it, no wondering if it was the spot–it sat there in front of me, full of water, paschal candle standing proud and tall beside it. I dipped my fingers in, crossed myself, and knelt in the back pew to pray. Seeing the place where I’d been dedicated to God, reborn as God’s child and birthed through the womb and waters of the Church, at that exact piece of rock, I cried. The verse from Jeremiah flitted into my consciousness, and I felt freed–at least for a moment–from my struggle against my vocation, its difficulty, its pain, its risk. It was never up to me anyway. From the moment I was doused with the holy water from that font, the moment my head was touched with those new living waters, my fate was sealed. As I knelt in that church, I knew, I’d been “Father Emily” from the time I was three months old. We baptize babies because God says, “before I formed you in the womb, I knew you;” by baptizing hardly-cognizant infants, we’re making a statement about our permanent cluelessness as human beings, and our enormous faith that God can do better than we ourselves could muster by our independent efforts. It’s acknowledging the truth that our future, our lives, our work, isn’t up to us, not really, but it’s lined up by God. “For you formed my inward parts; you knitted me together in my mother’s womb” (Ps. 139:13). Our gifts and talents and unique qualities are all already planted in us at conception, the die has been cast. The only question is how we–individually and as a community of faith–will respond to the die, the call, the gifts that we’ve been given. After praying in the pew for awhile, I grabbed a kleenex (I love that they’re always available–as if expected to be needed, that God will show up and make you respond with holy, cleansing tears–in those Roman Catholic churches) and walked back to stand at the font. I put my hands on the ledge and felt the cool stone. I wanted to be doused in the water again, to have my parched soul quenched, to be enlivened for ministry with the living water. This font is my birthplace. The actual womb of the church, from which I have been born. I go back and remember (remember the thing I never knew in the first place, except for the dozens of baptisms I’ve witnessed and performed since). I know that people made promises for me there, in that room, in May 1986; they joined me with them on the journey of people being led by God. I went back to touch the stone and the water, to feel again the solid, stable rock of the promises that were made for me, the sacrament that was enacted. I don’t figure I’ll ever go back to the pond where I experienced “believer’s baptism” at as eleven year old. It wasn’t counterfeit, and I’m not embarrassed–it’s just further evidence for me that I’m totally neurotic in my seeking of the God who’s always standing right next to me anyway–but that pond, even with the photos I have of the moment, doesn’t carry quite the same weight, because it was words that I said for myself, having “made a decision” to follow Jesus. What I mean is that I think there’s something especially powerful about whoever was there back in 1986 making promises on my behalf, about holy water making me born again when I’d just been born. I didn’t really choose to be born, or make a decision to fly down the canal into the world, just like I didn’t really choose to be committed to God’s service through baptism and made a member of God’s family when I was baptized. It’s those commitments that are made either for us, or when we don’t know at all what we’re promising (like winding up pregnant–making a sort of pact with the next generation, or wedding vows–all of life together blank, and in front of you) that end up defining us the most. For one, I know that it will never feel the same for me to dip my finger into holy water and to cross myself; I’ve done it for years when I enter churches who offer it as a physical way of reminding myself that I’m baptized and belong to God. Now, having done it in the very font where this journey started, each way station of holy water will remind me of that one, and of that afternoon, when I was reminded that far from this journey being a meandering or deadening drag, it is instead, by God’s grace, led by the Good Shepherd himself. This entry was posted in baptism, community, family and tagged Baptism, call, Jeremiah, Lumen Christi Community, Roman Catholic, vocation by Emily. Bookmark the permalink.